Michael Fassbender is a multiple award-winning actor who is best known for his roles in the X-Men movie series, starring as the younger version of Magnito as well as in 12 Years a Slave (2013) where he brought the character of Edwin Epps to life. Fassbender, who speaks fluent German, has one of the broadest acting reaches among actors in his generation. It is no surprise that he has expressed interest in performing in a German-language film to further cement his reputation. Read on to find out more about his personal life, earnings, and other facts. Michael Fassbender was born to an Irish mother, Adele, and a German father, Josef Fassbender, on the 2nd day of April in 1977. His birthplace is in Heidelberg, Baden-Württemberg, Germany. He and his older sister whose name is Catherine, however, grew up in the countryside of southwestern Ireland where their folks relocated to when he was two years old. For his education, the youngster started at Fossa National School and proceeded to St. Brendan’s College where he got his secondary school education. There, he decided to become an actor, having enjoyed acting in the few school plays he was cast in. At around the age of 19, Fassbender left home and took to London to hone his drama and acting skills. He enrolled at Central Saint Martins’ Drama Centre London. He stayed in the school for two years before dropping out to join the Oxford Stage Company whom he toured and performed with. His first notable on-screen role came in 2001 when he was cast in the award-winning miniseries by Tom Hanks and Steven Spielberg named Band of Brothers. Between 2001 and 2006, Michael Fassbender appeared in a number of UK radio, movie and stage productions, most notably the stage version of Quentin Tarantino’s Reservoir Dogs and the BBC Radio produced Book at Bedtime series before he caught his big break in the movie ‘300’ (2006). He garnered further worldwide acclaim for his performances in Hunger (2008) where he portrayed late Irish revolutionary soldier Bobby Sands who went on a hunger strike that led to his death in prison. His performance earned him roles in Tarantino’s ‘Inglourious Basterds’ (2009) and Andrea Arnold’s ‘Fish Tank’ (2009) and further cemented his reputation as a reputable actor. In 2011, Fassbender displayed his acting reach by first starring in the superhero movie X-Men: First Class as Magnito before going on to play Carl Jung in David Cronenberg’s A Dangerous Method. That same year, he put in a Golden Globe and BAFTA Award-nominated performance in Steve McQueen’s Shame. The Steve McQueen – Michael Fassbender formula for a critically acclaimed movie continued as the actor starred in the multiple award-winning 12 Years a Slave (2013). He further played Apple founder Steve Jobs in the self-titled movie which earned him another nomination for an Academy Award. The German-Irish actor, who has some of the most prestigious awards from the entertainment industry in his trophy cabinet at home, thanks to the various roles he has perfectly executed in blockbuster movies, is said to have a net worth of around $30 million. This has afforded him a lavish lifestyle as he recently splashed out $2.35 million on a new home in the Portuguese capital of Lisbon. He also has a very expensive hobby, the Daytona Ferrari Challenge, where he and a number of other actors race each other with their luxurious automobiles. 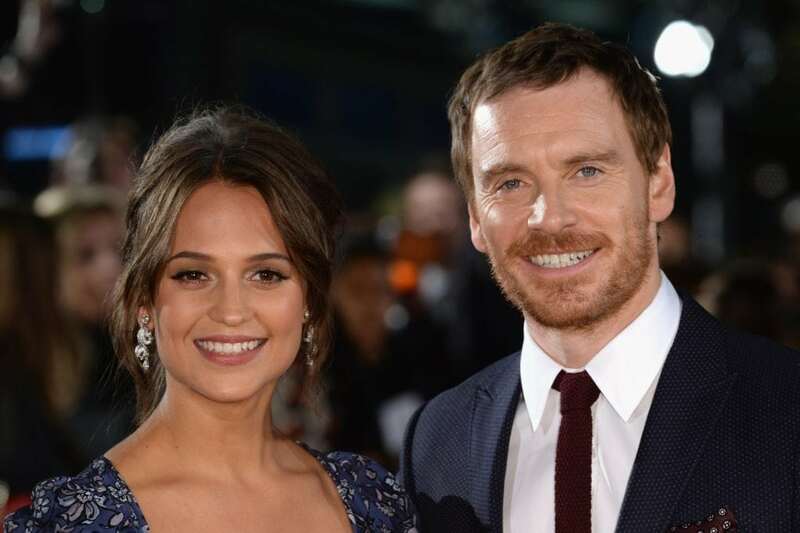 Michael Fassbender is married to Oscar award-winning Swedish actress Alicia Vikander. The couple met for the first time in 2014 while they were shooting the film, ‘The Light Between Oceans’, in which they played a married couple. They dated for three years before exchanging vows in October 2017 at Finca Can Marti, an eco-hotel in Ibiza, Spain. Going by Michael Fassbender’s dating history and his recent marriage to Alicia Vikander, it can be accurately deduced that he is indeed not gay. The actor has, however, played different roles including one in the sci-fi horror film, ‘Alien: Covenant’ (2017) where he supposedly kissed another man, who was actually himself as he played both characters.